The first red is from these felted tree ornaments I made using the Cocoknits tutorial. Since I was using some Styrofoam balls that I had earmarked for a different project, they were a little too big for felting (2.5-inches across). I made a huge mess in the kitchen between all the yarn bits, boiling water, and copious amounts of detergent. Out of the 4 I made, 3 were good enough to give away. The wool yarn scrap coating on the 4th ball just wasn't thick enough and it kept on breaking as it dried. Will I make these again? Perhaps, but if I do, I'm going to use 1-inch balls instead. The second red is from these watermelon radishes. Although they were delightful raw (crisp, peppery, and slightly sweet), I still gave them a toss with some heat and a little pancetta fat. They were delicious, but then again, isn't everything more delicious with pork fat? 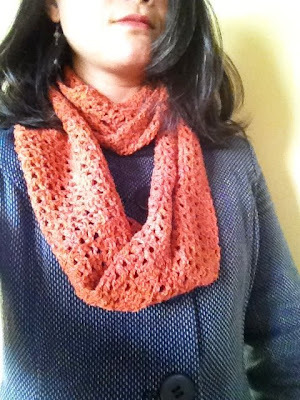 The orange is this hot off the press looped scarf. The stitch pattern was modified from a sweater I thought about crocheting until I realized it was just the stitch pattern I adored. The scarf is made from my stash yarn, Elsebeth Lavold Silky Wool. I have a few more hanks of the stuff, and since the one pictured is already looped around my friend's neck, I immediately casted on (chained on in crochet-speak?) for another. I've been on my own for a little over a week, and the meals I've been putting together for myself have been strange and frugal. Besides pancetta, I haven't cooked any meat. Red quinoa, hummus, and pan roasted radishes was lunch. Dinner from a few nights ago included an avocado, one bunch of kale, and pasta with a slow cooked, fire roasted tomato sauce. It feels foreign to cook such small amounts, but I'm not a fan of eating the same thing over and over again. Lest you think it's all been healthy, the holidays have also brought parties filled with butter and sugar laden goodies and booze. Hm, maybe that is why I am eating more simple fare when I cook for myself. 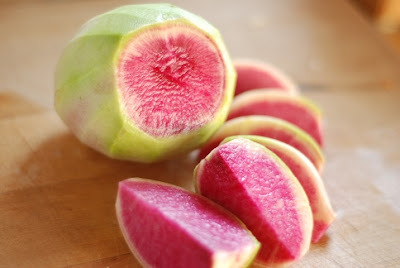 I've never seen watermelon radishes before! What a fantastic colour! Merry Christmas. I have really enjoyed your blog this year. I love the cat hat patterns. My cats are nervous, they sense some furmiliation in their futures. Hee hee. 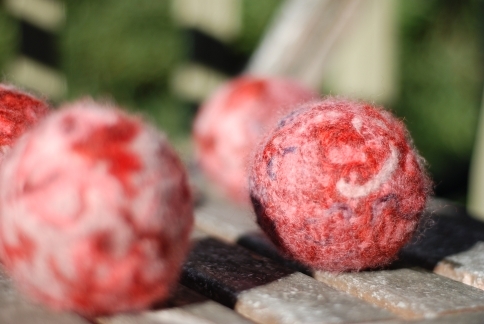 I thought the felted balls were candy. I would have eaten one. I've never heard of those radishes. And to be honest, I bet I won't find one around here any time soon. We're in the "fruit imported from a different hemisphere" season. It's hard to find delicious bits like that. Foodycat, the radishes were amazing! Not too much of a peppery bite, and they went really well tossed with a bit of butter and some salt. Kimberley, yes! Your cat must be furmilated soon. Consider it a New Year's resolution. Rani, I'm glad no one tried to eat the felted balls! They turned out so fragile. I'm surprised that you can't find such goodies nearby. I always imagined that you lived in a rural community with loads of farmers.